Blondie and Brownie: Last Call for Pancakes! 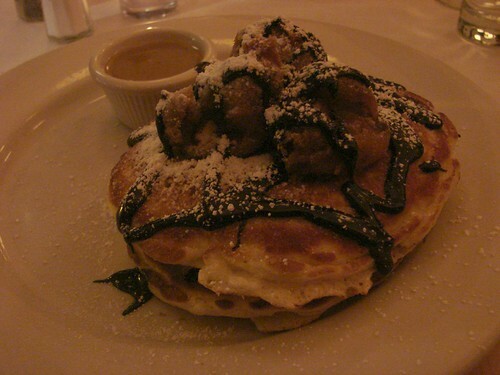 Of all the pancakes that I've tried at Clinton Street, these are most definitely my all time favorite. Imagine banana pancakes topped with a delicious fried battered banana tastiness and decked out with cinnamon-chili-chocolate sauce. Yum. The cinnamon-chili-chocolate sauce is tasty. The spicing was more subtle then I expected, but still good. There was a decent amount of chocolate drizzle, but I wouldn't have minded a more liberal dousing. What can I say? I love me some chocolate. Today is the last day for Pancake Month at Clinton Street Baking and they are serving these pancakes again. Don't wait until next year to give them a try! sounds wonderful ! I have to get to this place very soon!!! thanx for sharing !! i went today. delicious as expected. still a 90 minute wait at noon... but well worth it.